Game description: Fatal Fury: Battle Archives Vol. 1 includes four classic Fatal Fury games: Fatal Fury, Fatal Fury 2, Fatal Fury Special and Fatal Fury 3: Road to The Final Victory. 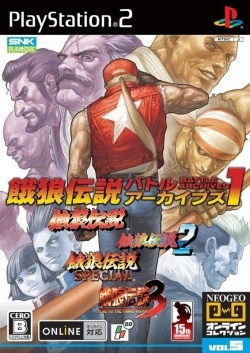 The Fatal Fury series was SNK's first ongoing fighting-game franchise, and many beloved SNK characters and locations made their first appearances in Fatal Fury. Fatal Fury was also the first fighting game to feature a two-plane system, allowing characters to dodge out of harm's way when confronted with a challenger's attacks. This page was last edited on 4 April 2017, at 23:45.